Posted on December 22, 2016 in Industry by Emily E. Steck. We can all agree that two heads are better than one. What about three? A thousand? For the most part, yes and yes. And thanks to the internet, it’s easier than ever to crowdsource ideas and inspiration. Nowhere is this more apparent than with content marketing: brands and publishers love to turn to social media communities and platforms to inspire content ideas for their verticals. A trending meme on Reddit will garner millions of views on Buzzfeed in just a few hours. A thoughtful discussion thread on Quora can spark a blog post idea. And so on. The challenge for content marketers, then, is to generate content ideas through communities while respecting the community and original content creator. Here’s how content marketers can use communities like Reddit and Quora to crowdsource content ideas. The “front page of the internet” is a known content generator for viral sites like Buzzfeed and works as a great barometer for the internet’s opinions and interests on virtually any topic. It’s a good place to start watching what audiences are interested in and like to read. There are two major ways for content marketers to approach Reddit. One is to directly ask Reddit communities for feedback on a given topic. As long as you are honest and transparent about your questions, this is a safe way to collect opinions from real people and even validate your ideas and strategy before you start the process of content creation. The second way to mine content ideas from Reddit is to sit back and watch. Reddit can act as a social listening channel offering insight into specific niches for coveted demographics. For instance, one of our clients prefers to use Reddit as a listening channel to see how millennials think and comment about personal finance. They believe that millennials who are financially savvy are more likely to contribute to an informed online discussion on a platform like Reddit. Fair warning: Redditors, as they are known, are wary of brand interference on threads and can be at worst hostile to any brand-related questions—so be transparent with your intentions and check in on reader comments regularly. Get content ideas that help you reach, engage, and convert with Quietly Insights. Ask and someone shall answer…eventually. Quora is a community of curious people and experts who ask and answer questions that are often more complicated than Google search allows. It’s a community that allows us to see the questions people are asking, and read the long-tail answers. 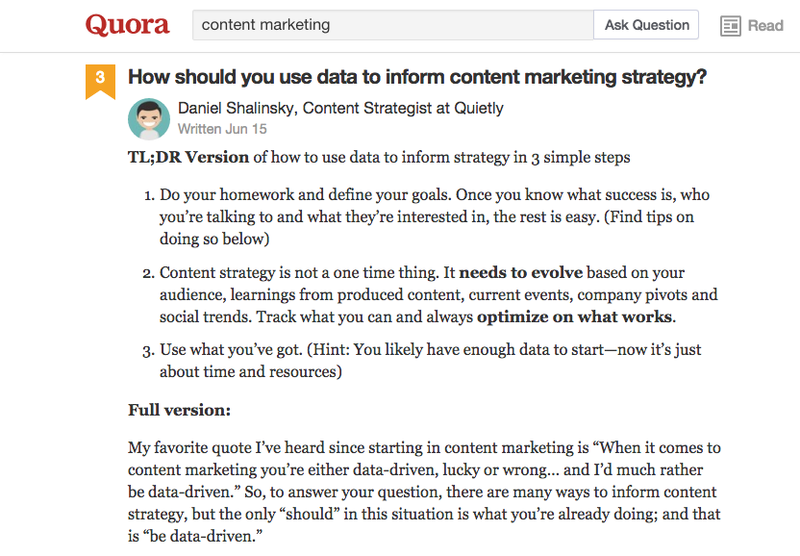 Quora is a favourite amongst content marketers because it’s a great directory of ideas that fulfill top and bottom of the funnel content depending on how deep down the rabbit hole you go. We’re getting meta here, but at Quietly we use Quora for our clients and ourselves. For example, we look at relevant categories for niche B2B clients as a listening tool for real discussions happening between professionals in particular industries. It’s a useful tool to discover what professionals are seeking to learn more about and to see how competitors may be responding. It’s given us considerable traffic, eyeballs and even leads. In this case, Quora is a tool to publish content as well as generate ideas. Reddit and Quora are not the only communities on the internet from which to crowdsource and generate content ideas. Far from it, actually. However, we can’t dive into all of them, so we’re just going to highlight the ones we like most. This is less of a community tool, and more of a keyword tool. But it’s still a useful one to help jog a brainstorming and ideation session. We’re not trying to give away too many trade secrets here, but Google Trends is perfect for generating content ideas. We’ve written about the wonders of Google Trends’ Explore function before, and adding it to this list is a no-brainer. But we’d also like to give a shout out to the undersung secrets of Yahoo and Bing ad intelligence, which can be just as illuminating as Google’s tools. It’s important to remember that not everyone uses Google after all. God bless Twitter chats. These community-centric events feature real-time questions and answers on the content marketing–friendly platform, Twitter. It’s easy to search and find hashtags for Twitter chats and other trending events. Follow the chats in your industry and make note of what questions are being asked, what answers have arisen and how you can tune into the conversation. Using these topic machines is only one way to generate content ideas. We’ve done this for many clients and the results speak for themselves. For more data-backed content ideas, connect with a content marketing partner like Quietly. 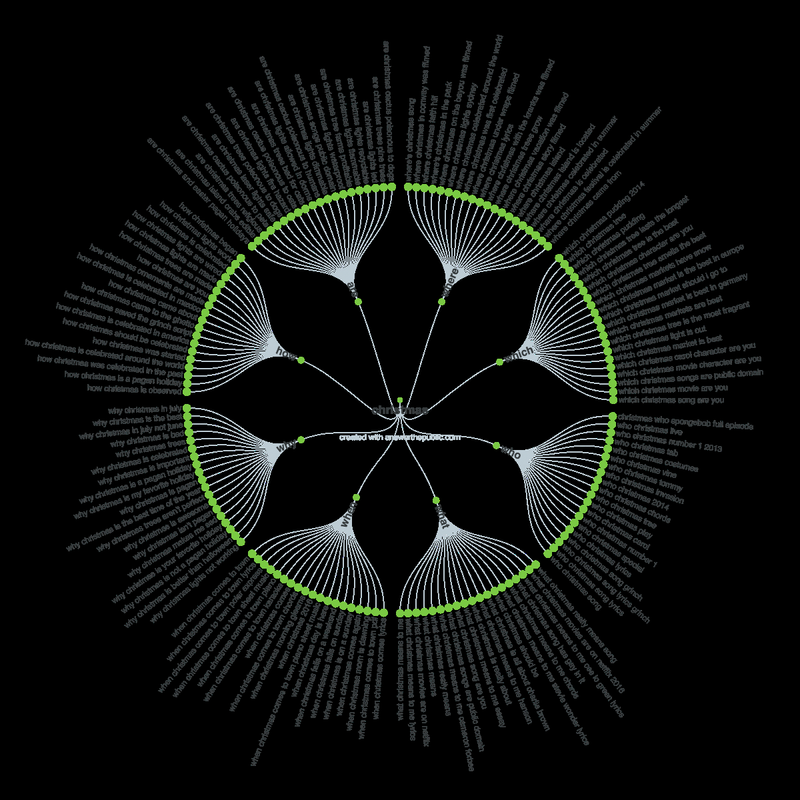 Understand and deliver better content marketing with Quietly Insights. Understand how Quietly can help play a role in your content marketing efforts. Get a free consultation for your content marketing strategy. Receive our monthly newsletter to stay up to date with everything you need to know about content marketing.